I was recently sailing my TI (bought Feb 2013) on a small lake in France in a force 4 wind, when the mast broke. There was no swell, and only small waves, so much calmer than conditions can be at sea where I live, which is Guernsey in the Channel Islands. I was sailing with my wife, and we were on a reach, and had just turned further off the wind to be on a broad reach, when it broke with a loud crack. We were using the full sail, as we had not been over-pressed during the previous 40 minutes of sailing around the lake. It was very fortunate that this happened only 200m from the shore, as we could easily get back using the Mirage drives, and with my wife holding the mast and sail alongside the kayak. The consequences of this happening in the seas around Guernsey would have been much more serious, so in a way, I am relieved that it happened on a small lake. But I am surprised and very disappointed that this happened at all. 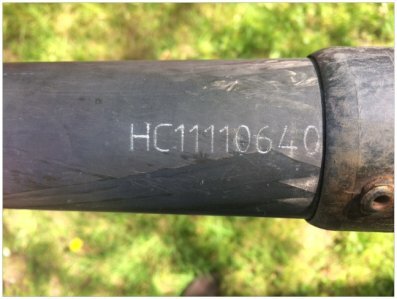 Surely a carbon-fibre mast should not break under these conditions, even if it is 4 years old, and therefore 2 years outside its warranty period. 1. 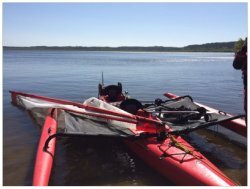 Is the Hobie TI safe to sail in a Force 4 wind, given that the mast may be subject to a catastrophic failure, even in calm water? 2. 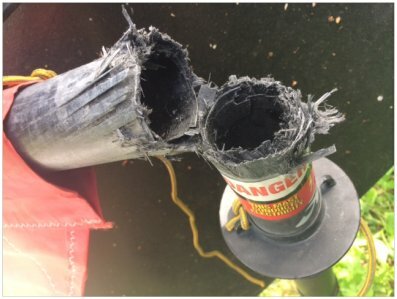 Should Hobie be recommending the replacement of the TI mast every 2 years, in order to prevent a catastrophic failure such as this? I would like to add that I have sailed my TI solo, and with my wife, around Guernsey and Herm, as well as the UK, France and Spain, on lakes and at sea, over the last 4 years. 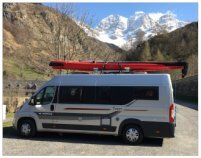 We carry it on the roof of our Fiat Ducato campervan. It is a very important part of our leisure activities, and always causes great interest wherever we sail. I have often sailed it in a Force 4 wind at sea, so I am particularly concerned if Hobie regard mast breakage as being an expected event in a 4 year old Tandem Island. I noticed that my mast on my 2017 TI has a sliver of carbon fiber missing near the base. I brought it up to my dealer and he said he can't do anything about it until it breaks completely. It is possible the mast was damaged in an earlier outing, but finally gave way in this lighter wind condition. much calmer than conditions can be at sea where I live, which is Guernsey in the Channel Islands. There is a LOT of load on a fully deployed sail and heavily loaded boat. Add to that chop or waves... It is best to partly furl the sail in windy conditions to reduce the load and can actually be faster. That said... a 2013 mast has also seen a lot of sailing time I imagine... and possibly UV damage as well. It is very difficult to determine the actual cause or what a preventative replacement cycle should be. There is a LOT of load on a fully deployed sail and heavily loaded boat. Yes, obviously, so the mast should be designed and made to withstand these loads. Yes, after all it is a boat. It is best to partly furl the sail in windy conditions to reduce the load and can actually be faster. This is a very vague statement. I had already explained that we had been sailing for some time, in relatively smooth conditions, and not over-pressed ( i.e. I did not consider it necessary to furl the sail) when the mast broke. Well, about 4 years of occasional sailing during the 6 months of each year when the weather is suitable. Are you saying that the mast has a known limited life? If yes, what is this limited life? 2 years (warranty period)? and possibly UV damage as well. I have only exposed the mast to the sun whilst sailing it. The rest of the time it has been stored indoors in the Hobie cover, which I presume is opaque to UV. Are you saying that having the section of mast which broke exposed to the sun is a design fault, and it should be covered whilst sailing? Hobie has made no attempt to establish the root cause, and you have no policy or guidelines on preventative replacement of the mast, as far as I am aware. But presumably you have a Quality System, and analysis of reports of mast breakages posted on this forum and elsewhere, might well reveal what the root causes might be, and what action Hobie can take to prevent re-occurrence. You should be looking at trends and commonalities between failures. You may be interested to know that the lower rivet on moulding which attaches to the bottom edge of the sail where the mast passes through, has corroded away, so possibly there has been some electrolytic action between this rivet and the mast in the presence of salt water. Maybe a weakness was created in the mast at this point, which initiated a crack. But how do you expect to find out possible root causes such as this if you do not investigate complaints thoroughly? Those were all possible causes... Your course of action should be though your dealer if you feel it could be a defect... regardless of age. We typically will review older claims. Matt, I have done exactly that - notified Hobie UK, who have forwarded it to Hobie USA, who have told Hobie UK that I need to order a new mast. So you should have already seen my pictures outside this forum. I have already ordered a £774 ($995) replacement. However, you may be interested to see the following pictures, which identify the true root cause. The mast actually broke EXACTLY at the point of contact with the lower rivet on the downhaul moulding. These 2 pictures show it with a new lower rivet, which I replaced after the mast had broken, and I had removed the sail from the mast. So this eliminates UV degradation as a root cause because the break point was covered by the sail. The mast has not even broken at the point of maximum bending. So why has the mast broken where it contacts the rivet? The answer was actually visible in one of the original photos which I provided. The upper rivet has also caused a clearly visible arc of wear on the mast, which would severely weaken it. So the root cause is actually a design fault. The mast should have been protected from these rivets, or another method of attaching the downhaul moulding should have been used. 1. Initiate a design change to stop current production from being similarly affected. 2. 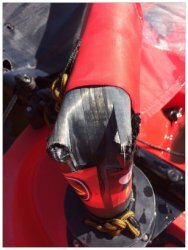 Since mast breakage is a serious SAFETY issue, you should notify all owners of Hobie boats with a similar rivet - to - mast contact problem, to inspect the mast and rivets. If the mast is visible worn, it will be weakened. 3. In the safety notice, you should also inform owners of how they should protect the mast from wear caused by these rivets. I will certainly be adding a thin plastic sleeve, or something similar, between these rivets and my new mast, unless you can recommend some other solution. I will forward on to engineering for review. Interesting...may be a coincidence though. The failure looks to me to be several inches higher. Matt, you need to take this seriously. 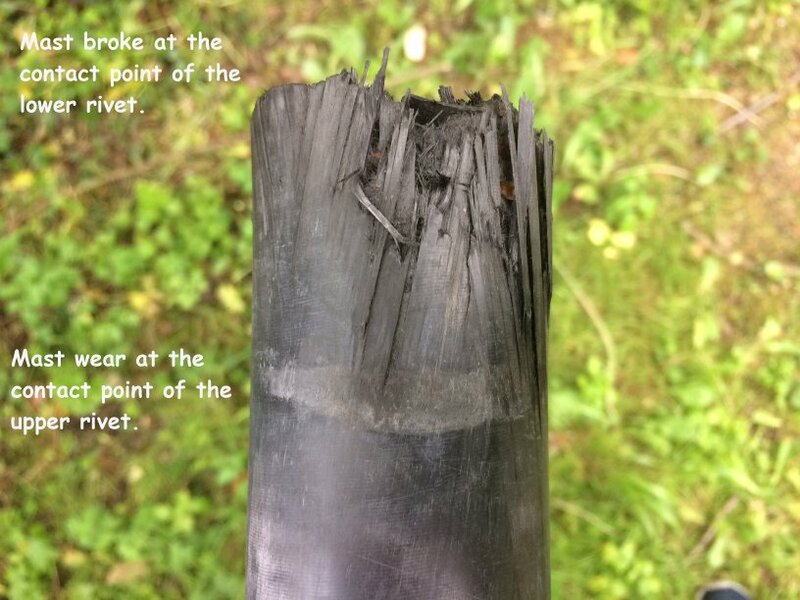 The mast broke exactly where the lower rivet was in contact with the mast. The wear from the upper rivet is clearly evident. I have been a Quality and Regulatory Director for a medical device company for 30 years, so I know how complaints should be investigated and actioned. Hobie needs to take action, now that I have identified the root cause. 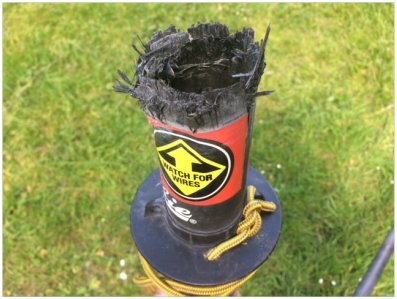 Lives can be put at risk if a mast breaks. How coincidental for me to see this post. Yesterday after a beautiful day out on the water, I noticed that the lower rivet on my downhaul failed which seemed unusual as I had never heard of anyone else having this problem. When I replace the rivet later this week I'll make sure to inspect the mast for any unusual wear. I have a 2016 AI. After thinking about this for a bit, I decided to pull my sail out and see if there was any damage to my mast from the failed rivet. Sure enough .... there's a line along my mast where the rivit was. Like someone took a file to the bottom of my mast. You can feel the gouges so I guess that's not a good thing. Although I'm not at all an expert on carbon fiber. Holy crap! OK, when I pull my sail out to put new tell tails on, I'll inspect my mast. 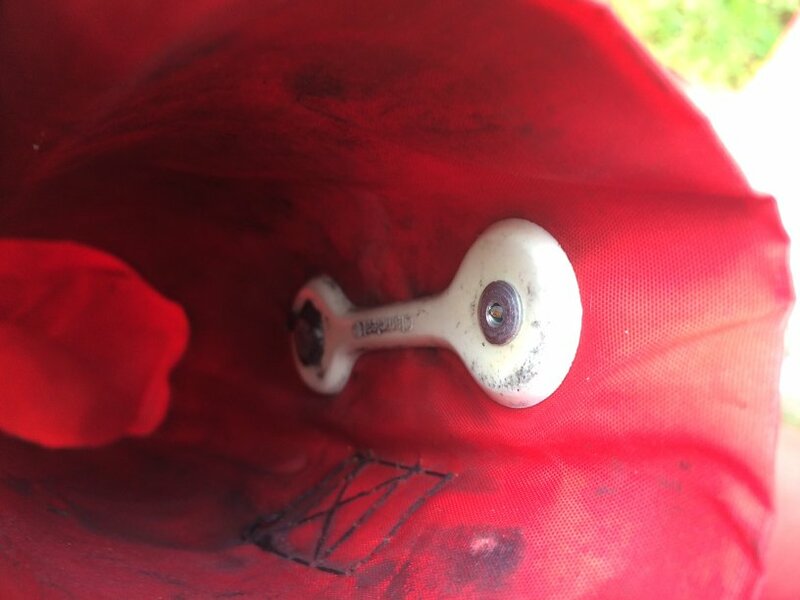 I just inspected my 2015 TI mast (which sees a lot of use) and it has some wear on the mast because of the rivets on the sail cleat. I dont know if that is why the OP mast failed or not.. but that is certainly not a good spot for wear. Its near the highest stress part of the mast plus its on the outer surface. So.. I just removed that cleat from the sail. Used a 3/16 drill and the trick is to keep the rivets from spinning so that they can be drilled out. Edit.. the sail is of course removed from the mast before doing this. Im going to sew on an additional nylon strap somewhere at the base of the sail so that I still have two attachments points.. There will always be some rotational movement there between the mast and the sail but the contact will all now just be distributed sail cloth. I removed my downhaul cleat so there will be no more scoring of the carbon fibers on my mast. From now on only the nylon strap will be used to attach the sail. Is it that important to have 2 attachment points? Is it that important to have 2 attachment points? I did sew on a second strap using a "speedy stitcher" http://www.speedystitcher.com/ but after doing that thought it might not really be necessary. I think that single stock strap is probably all you need. 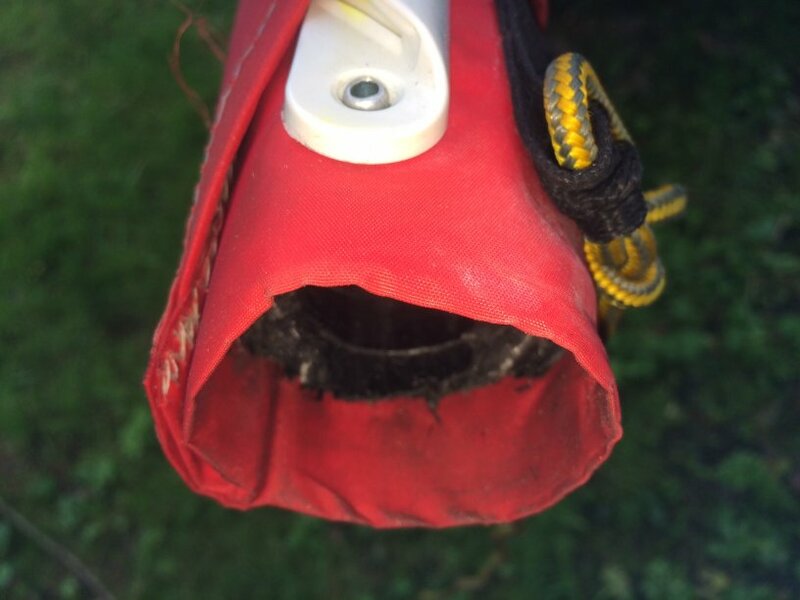 The marks I had on my mast were just beginning to show and this is after a couple seasons so this really isnt a big problem as at the rate Im going, my mast would have lasted many more years. Sort of like UV damage with these.. except that when the mast goes bad, it does it all at once. But regardless, that cleat is fairly easy to remove and mine is gone. You could also probably just wrap some tape around the mast in that area with the cleat in place and replace the tape once per season. This also got me wondering about downhaul tension. That tie is a little bit like a Cunningham which can be used to move the sail draft fore and aft a little. A tighter Cunningham brings the draft forward somewhat which you might want in rough water to depower the sail and make things more manageable. But a little looser on the downhaul up to some point brings the draft back for best power. So.. Im thinking that a single strap with just moderate tension on the line likely is all that you need.. 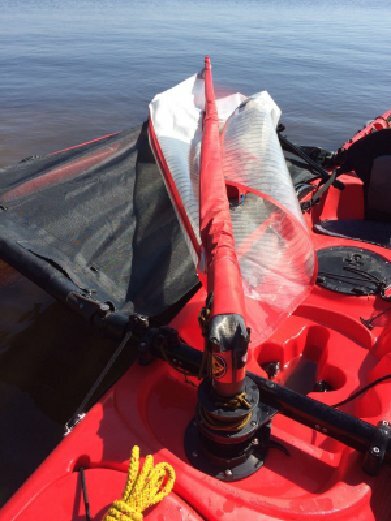 But I have never experimented with the downhaul tension on the Hobie TI sail / mast.. so am not sure if there is any influence on performance.